A few easy steps to safer travel this wet season. So many cars built in the last 10 to 15 years include a wonderful little feature which allows the driver to simply set the lights to the ‘automatic’ option. As you may already be aware this allows simple peace of mind as you drive through changing light by automatically turning your headlights on. This, of course, means you won’t have to worry about seeing clearly, or being seen as the day draws to a close. Another handy feature that nearly all vehicles on the road have these days has the ability to dim your dashboard lights via a small dimmer switch. 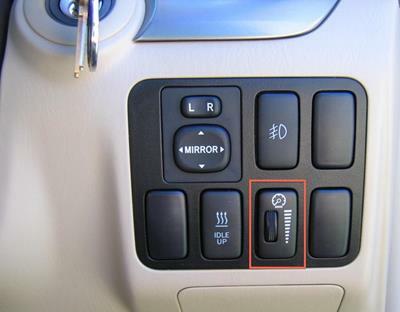 This is most commonly, though not always, positioned near the headlight control switch (pictured below). Play around with it to find what suits you best. Quite often it’ll be set to the brightest setting which is excellent to keep you awake as it’s so bright, but can cause distraction and sometimes glare against the windscreen. Due to recent changes in laws regarding lane filtering of motorcycle laws (check out the new laws here) you may see motorcyclists creeping up or ‘filtering’ passed you at traffic lights. Now, more than ever, it will be necessary to be aware of motorcyclist and bicyclists as you go through traffic lights, especially while turning. Clean, fog free windows allow safe travel in low light, changing light, and under artificial light. Greasy, foggy windows do not. If you’re not sure if your windscreen fogs up easily you’ll soon find out. While it is never particularly safe to drive with a foggy windscreen it becomes especially dangerous when facing an oncoming car, not only because another moving object of similar size and speed is approaching, but also because of the extra glare created by their headlights. Although this is not a definitive guide by any means, these few tips should go a long way to helping you avoid any unfortunate accidents especially as we approach the Easter break. As usual, if you need some help with some minor (or major, we do it all) dent or scratch removal, just give us a call, or come and drop by. All quotes are FREE and we’d love to see how we can help. So why wait, show your car some love, take it for a spin and drop in for a visit. Woodside, Woodside North, Lobethal, Birdwood, Mount Torrens, Lenswood, Charleston, Cherryville, Oakbank, Balhannah, Harrogate, Brukunga, Bridgewater, Hahndorf, Mount Barker, Nairne, Littlehampton, Gumeracha, Cudlee Creek, Uraidla, Adelaide Hills, Mount Pleasant, Mannum, Kanmantoo, Wistow, Stirling, Aldgate, Crafers. Contact us at Woodside today to discuss your crash repair needs. Stepney, magill, norwood, St. Morris, College Park, Maylands, Kent town, Adelaide, Trinity Gardens, Kensington, Kensington Gardens, Kensington Park, Rostrevor, North Adelaide, Hackney, Evandale, Gilberton, Walkerville, Rose Park, Toorak Gardens, Leabrook, Rosslyn Park, Burnside, Wattle Park, Beulah Park, Payneham, Payneham South, Newton, Marden, Royston Park, Walkerville, Eastwood, Dulwich, Glenside, Tusmore, Heathpool, Vale Park, Parkside, Eastwood. Contact us at Stepney today to discuss your crash repair needs. Night Vision – Something that affects us all who use the roads is visibility. So when the weather gets a little wild, and the sun seems to go missing, we start to spend more and more time on the road with our headlights on. This means the condition of our headlights can play a huge role in our safety on the road. Think about what your headlights look like now, and how they compare to the picture below. If they are closer to the ‘after’ picture, you have nothing to worry about. 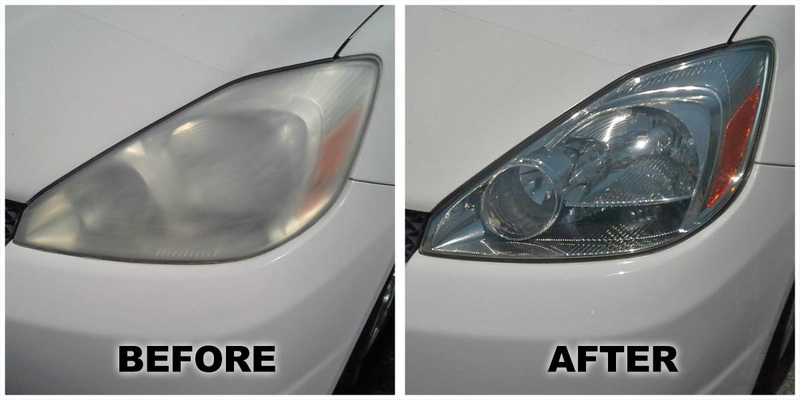 If your headlights look more like the ‘before’ picture, you may be in a little trouble. Having headlights like the ‘before’ picture you see below can mean up to 30% reduction in clear vision when travelling in the dark. This is terrible news, especially if you commute along country roads, or anywhere that street lights aren’t there to help. It’s inconvenient and downright dangerous. Why drive around with reduced vision and increased risk when driving at night, why not come and have them professionally cleaned by one of our team. You’ll notice the difference immediately.